The nine presets on the B9 offer a wide range of popular and classic organ sounds. The presets are named: Fat & Full, Jazz, Gospel, Classic Rock, Bottom End, Octaves, Cathedral, Continental, Bell Organ. Fortunately, the preset names are printed on the face of the pedal so any time you want to dial up a certain sound you simply read the preset names instead of having to scroll through the different presets like other pedals. Even if you aren’t familiar with organ sounds, you will have a good idea on what each preset is likely to sound like just from the names which make it very easy to quickly find an appropriate preset. 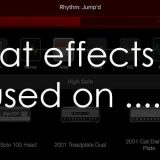 These effects add to the overall character of each organ sound and give you plenty of flexibility in your tone. Classic B3 and C3 organs have a percussive sound and the ‘Click’ control on the B9 emulates this effect. The Click Knob allows you to control how much of this percussive sound is mixed in with your signal. The click is added when you first pick a note or chord and is available on most presets. On Cathedral the Click knob adjusts the tremolo depth, on Continental it controls the vibrato depth and on Bell Organ it controls the bell or chime sound. Again, this gives you plenty of flexibility on the type of organ sound you want to produce. The B9 includes not only a volume knob for the organ sound but a separate knob for a dry signal. This means it’s possible to mix the two together in any way you like. This is far more flexible than having a single Dry/Wet knob found on most effect pedals. The B9 uses a buffered bypass controlled by the main footswitch. If you’re not sure what this means or whether it’s good or bad for your situation, check out this guide. There are two outputs on the B9: one for a dry output and another for an organ output. This gives you plenty of flexibility as you can send your organ output to a different amp or speaker system than your main signal if you wanted. The DRY output jack takes your unprocessed guitar signal and passes it through a buffered bypass. It will send your dry signal through regardless of whether the B9 is set to bypass or active. The ORGAN output is controlled by the two Dry and Organ knobs. This means the DRY output jack’s volume level isn’t controlled by the Dry knob. If you don’t want to split your signal, simply use the ORGAN output jack. While the B9 has plenty of flexibility, it’s easy to use. Simply plug your guitar in and use the ORGAN output jack. Thanks to the preset names printed on the pedal, it’s very easy to dial up a certain sound and know what to expect. You only have two main controls to adjust your organ sound (MOD and CLICK) so you won’t have to spend much time tweaking your tone. For a more advanced setup, you can direct the ORGAN output to a separate rig solely for the organ sound and run your normal guitar sound through the DRY output. With this setup, you can control what effects are only applied to your organ tone and what applies to your normal guitar tone. It’s a very nice ability to have. It’s worth mentioning that you need to be aware that any other pedals or amp settings you use will either enhance or distract from a good organ sound. Some effects will work well together and others you will notice sound rubbish. For example, certain overdrive or distortion pedals may work with some of the presets to create a gritty/grungy sound. Other distortions may just add to the noise. I experimented with different distortions from my Line 6 POD HD500X and found that for each preset, only certain distortion presets would work well together. So the point to take away here is to experiment with your existing gear to figure out what effects work well together and which ones don’t. Whenever I’m writing a song and I want a different instrument to play something, I love being able to create those different sounds (eg: sitar, banjo, synth, pad, strings, etc.) while playing guitar (instead of playing a keyboard). Being able to connect a guitar with a MIDI pickup into a soundbank and instantly access a wide range of different instrument sounds gives me a lot of freedom. However, I often feel that the end result can be a bit lifeless or cold. While the sound quality of a MIDI pickup system connected to an organ sampler would produce more authentic organ sounds compared to the B9, there’s something ‘real’ or ‘grungy’ to the B9. It feels more real to create an organ sound using the B9 compared to playing through a MIDI pickup and using a sampler. The B9’s imperfections give it a better feel from a guitarist’s point of view – it’s fun to play. While I love the B9’s grittiness and realness (are those real words? ), on occasion I dial up a setting that makes my ears bleed. The B9 sounds the best when you play in the lower half of the guitar’s range. Low chords or mid-range leads sound great growling from your amp. Venture up to the higher range and you’re likely to suffer a sharp piercing screech that will leave your ears ringing for hours. Of course, it’s a good reminder that you need to think like an organ musician to achieve the best sounds. So if you plan on shredding away on your high E string above the 12th fret, don’t be surprised if it sounds like fingers on a chalkboard. As you can see from the above examples, the B9 offers a nice range of different organ sounds. The versatility is what I like the most about the B9 Organ Machine. Being able to switch between a Pink Floyd style organ to a more lively lead sound then to a nice jazzy sound is a great creativity tool. While of course, the sounds produced by the B9 won’t ever compare to a real organ – as a guitarist what is more important is that you will enjoy producing these sounds and it really does feel warm and lively. At first, I was worried about the tracking. A lot of these type of pedals that promise high tracking usually require you to completely change the way you play and some only work well if you completely turn the tone down on your guitar and only use the neck pickups (eg: Sonuus G2M). I was nicely surprised with the tracking on the B9 – especially the clicking. As mentioned earlier, there is a knob where you can control the amount of clicking to emulate the percussive organ sound. I was worried that there would be erratic clicking similar to how a MIDI pickup can sometimes mistakenly retrigger the same held note over and over. With the B9 apparently the clicking is set up to produce the click on the initial attack on the strings on a note or chord, then the same note or chord won’t retrigger another click until the current notes have been released. In simple terms, this means that once you play a chord, you won’t hear the B9 accidentally create another clicking sound thinking that you picked the strings again. It will only retrigger another click if the chord’s amplitude falls below a threshold and you pick it again. I played around with different ways of playing the chords at different volumes and it worked exactly as I wanted. In short – the tracking and clicking sound works the way it should. The main point to remember with the B9 Organ Machine is that if you want to produce an authentic organ sound, you must play like an organ musician. You will notice from the video above that no bends or vibrato are used. If you start playing typical blues licks it won’t sound right. 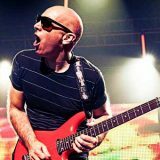 Jazz guitarists will find it easy to switch to an organ mindset while typical rock players may have a bit of a learning curve. Learn to experiment with different chord inversions, study songs using organ sounds and figure out how to copy those sounds. The more organ music you study, the easier it will be to produce an authentic organ sound. I’m really impressed with this pedal. In the past, I’ve tried pedals like this that claimed to give you authentic synth, sitar or organ sounds, but this is the first time I’ve been impressed with the results. If you’re a guitarist who listens to music that often uses an organ, this is a great way to enjoy playing those songs from a fresh perspective. Check out the price, details, and more reviews of the B9 Organ Machine here on Amazon. Cover bands – if you play in a band without a keyboard player and some of the songs you play use an organ, this is a no-brainer. While you could use a MIDI pickup, this is a far simpler option and arguably produces a more enjoyable tone. Switching to an organ sound to let rip on a solo will definitely turn some heads. 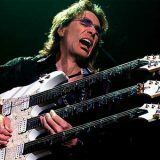 Otherwise, being able to create a layered sound mixed between guitar and organ is a great way to fill your band’s sound out (great for a three-piece band). Songwriters – this pedal forces you to think like an organ musician. From a creativity point of view, it’s a great way to think about chords, melody and rhythm in a fresh way. I found myself coming up with a lot of material for new songs after experimenting with the different presets. Blues/Jazz/Gospel fans – the organ is such a distinctive instrument and is used in a wide range of styles. Being able to switch to an organ sound in an instant is a great way to expand your musical range and look at songs in a new way. Obviously, if you’re not interested in having an organ in music, this pedal isn’t for you. Yes, you could use it to create interesting textures, but it probably won’t hold your interest in that way. If you don’t really like the styles of music that use an organ, then this pedal isn’t for you. Also, keep in mind that it takes a bit of time to learn how to use this pedal properly from a musical point of view. All your standard licks and riffs probably won’t sound right when used with the B9. So unless you are willing to study how organs are normally used in music, you probably won’t be thrilled with the results. Start with the pedal volume low then bring it up to level after turning the effect on. A piercing screech on this pedal because you had the volume up too high isn’t something I want to experience again! Study music that uses an organ. Try to learn what the organ plays and copy it on guitar. The most time and effort you put into understanding how an organist would create music, the better results you will end up with. Start with the MOD knob turned down then bring it up to learn how the modulation changes each preset. Just because modulation is available, doesn’t mean you should use it all the time. Only use effects when they add to your tone – sometimes it is better to have them turned off. Learn what other effects from your rig work well with the B9 and when you should/shouldn’t use them. Connecting a wah to the B9 for example is a unique experience! Especially with a bit of distortion. Experiment and don’t feel restricted to only producing traditional organ sounds. Use the pedal creatively. 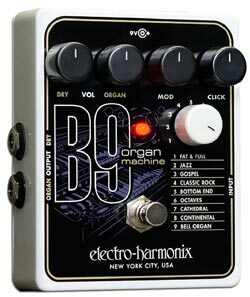 Since the B9 first came out, EHX have expanded their range of pedals to cover other types of keyboards and organs. The C9 Organ Machine provides 9 different organ sounds. The Key9 Electric Piano Machine recreates keyboard and electric piano sounds. The Mel9 Tape Replay Machine recreates Mellotron sounds. If you like the idea of the B9 but want different sounds, one of these pedals may suit your style better. An alternative to using a pedal to recreate organ/keyboard sounds is to use a MIDI system. The way this works is you use a MIDI pickup system such as the Roland GK-3 and connect it to something like the Roland GR-55. This option is far more expensive and requires a lot more gear, but the advantage is that in addition to creating organ sounds, you can produce any other instrument sounds (synths, bass, string instruments, brass instruments, ambient, etc.). Having MIDI pickups on your guitar completely opens your tonal possibilities. To learn how a MIDI system can open up your playing, check out my guide on MIDI here. I cover all the options worth considering and why MIDI is worth considering. If you’re only interested in an organ sound, the B9 Organ Machine is a far simpler and cheaper option. Alternatively, if you want to produce other instrument sounds, a MIDI pickup system will give you the flexibility not possible with pedals. See information on pricing, availability and other reviews on the B9 here.